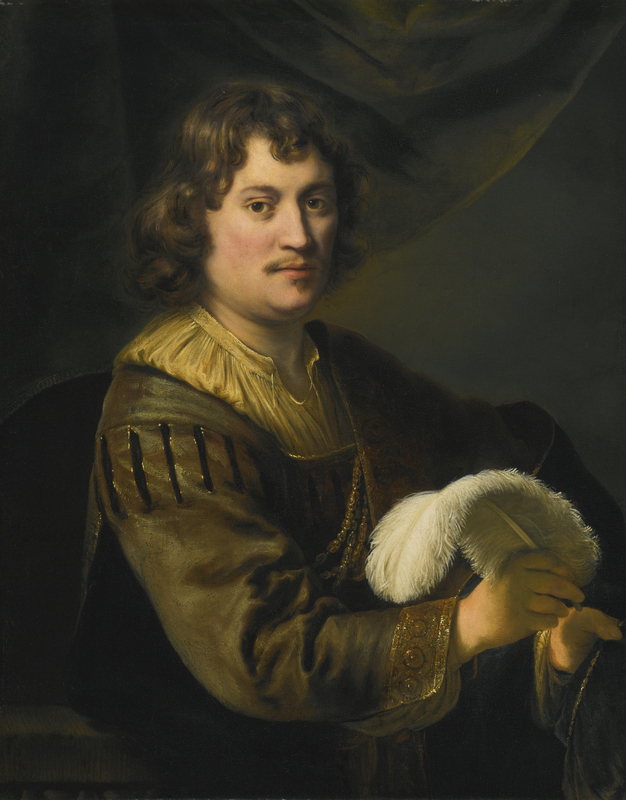 This portrait by Ferdinand Bol, a Dutch artist trained by Rembrandt, depicts a man holding a white plume. It was once thought to be a self-portrait but looks sufficiently different to others by the artist that the man is now described as anonymous.1 Whatever social meaning the white plume might have had for Bol's contemporaries, its inclusion here supports the reading of the figure as a self-portrait or, at least, as a self-representation. Bol, Portrait of a Man Holding a White Plume (1648) Oil on canvas. Private Collection. 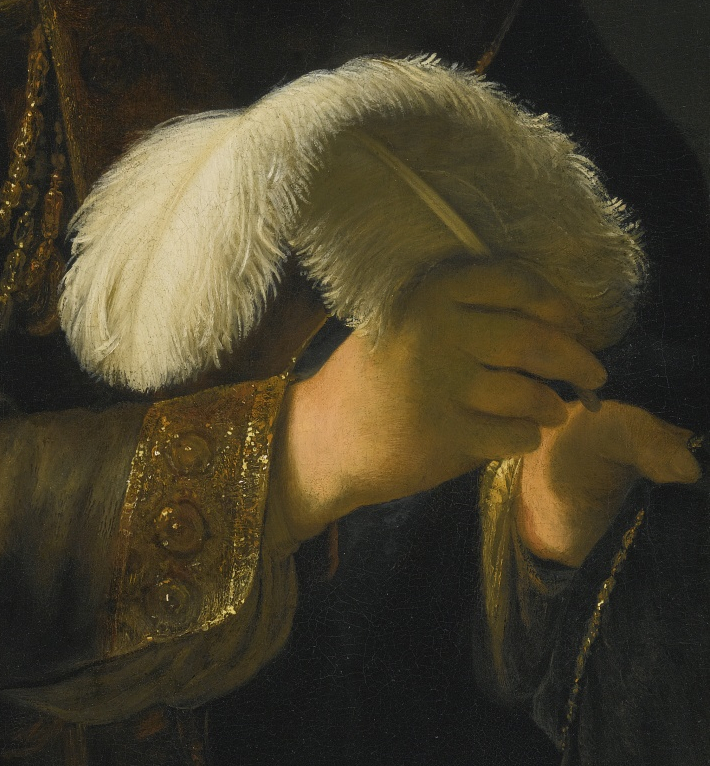 The feather's texture and shape somewhat resemble a paintbrush, especially when held like a quill, a link already noted by others.2 Its stem, however, is not hovering over paper as if about to write, but floats above the thumb of the man's other hand. It thus conveys that the man is about to paint his hand as both the artist (with the brush) and the model (being painted).3 In juxtaposition with the brush-hand, the other represents the palette-hand by showing the thumb alone, a common visual convention. Artists are well aware that only the thumb can be seen when stuck through the thumb-hole of a palette. In another painting by Ferdinand Bol, this time definitely a self-portrait, the artist himself holds a white plume as though painting his wife. That is why she appears so stilted and stiff compared to his figure and why the plume is turned so that its stem faces into the canvas as in the process of painting it from the outside. Flowers falling, as on the left, have been used by Titian in the Venus of Urbino, Bol here and Edouard Manet in Boy with Cherries to symbolize colors in the process of being transferred to canvas. They "drop", so to speak, from the palette or brush to the support. 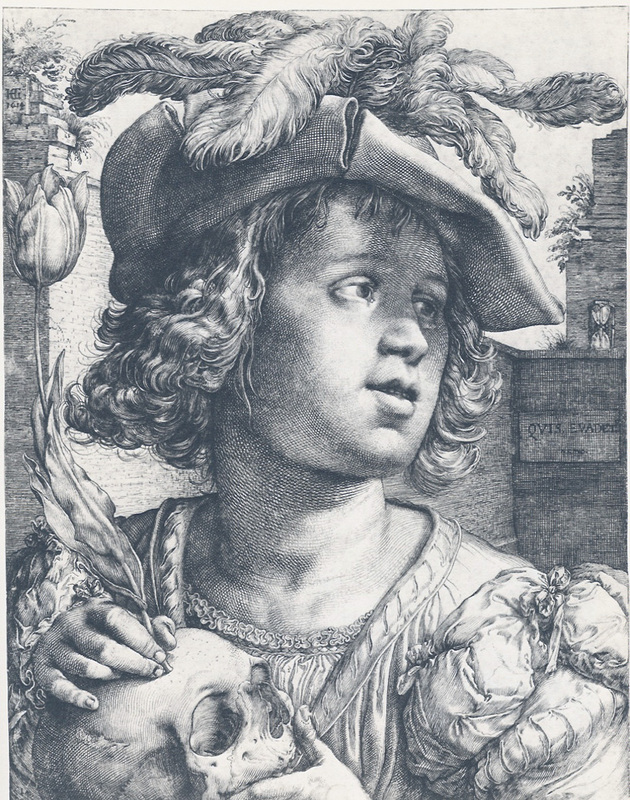 In a drawing from forty years earlier Hendrik Goltzius, another Dutch artist, depicted a young man holding a tulip as though it was a pen or paintbrush. Always described as a memento mori about the brevity of life, this image more poetically depicts a young man using a 'brush" to draw a skull thereby conveying that knowledge of one's inner self, and of one's mind (inside the skull), is the goal of art. Note how the orbital hole, the eye socket, not only resembles the bud of a flower but the tip of a phallus too. Thus, not only does the tulip draw the skull but the eye gives birth to the flower that "draws" it. To my mind, that memento mori and Bol's Young Man share a "moral", at least for us art lovers. Keep an eye open for feathers and brush-shaped items, especially those that share a similarly soft texture, and watch which way they face. Study the differences between the "artist's" two hands as well. One figure or feature of the image is likely to represent the artist, while the other, often in a visual disjunction from the "artist", is the image being created itself. These themes, though little-known, are so common in poetic art they can be seen in museums everywhere. I hope you have fun looking for them. 1. J. H. J. Mellaart, "Self-portraits by Ferdinand Bol", Burlington 43, Oct. 1923, p. 154 and ill. Plate II-A. 2. 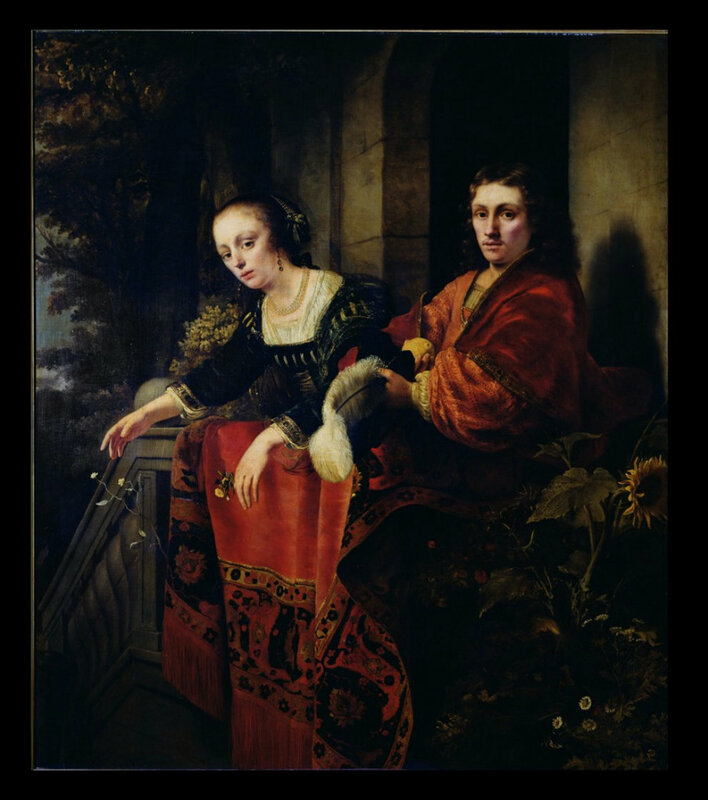 See Sale catalogue for Important Old Master Paintings at Sotheby's New York, Jan. 31st. 2013, lot 20. 3. Picasso's persistent use of this theme in the twentieth century was not his invention by any means but a very common theme in art for centuries as this portrait partially shows.